I was a bit hesitant when I first tried this combination last summer (see here). A scalloped hem with a striped top? The chance that it could be deemed "too much" was high, but once I had it on I knew I had finally found the perfect match for a skirt I spent years trying to figure out what to do with. There was no turning back. It was pretty much settled before I clicked "order" that this skirt would be similarly paired with a classic breton striped shirt. Since this skirt is a solid white, I think it's a bit more versatile when it comes to pairings. It should go with just about anything, which is always a nice perk. Whenever I shop for new pieces I try to think of a few things I would wear it with so once it arrives it won't just be taking up space in the back of my closet. It's a useful tip if you are trying to build a wardrobe of things you'd like to wear things for years to come. I hope you had a wonderful weekend. Happy Monday and thank you for reading! That skirt is adorable!! Love the sheer hemline and the detail! And stripes are easily one of my favorite things ever! Happy Monday! I've had my eye on that skirt for months now and am now wishing I had taken the plunge and got it! It is so gorgeous and I absolutely love the classic pairing of the stripe top! Oh I love this!!! It's different then your usual style, but I dig it. The skirt is just gorgeous! That skirt is stunning!! Love love it for Spring and Summer! Not too much at all! I live in stripes, so for me they go with any and everything! So pretty! That skirt is the cutest! I love it! 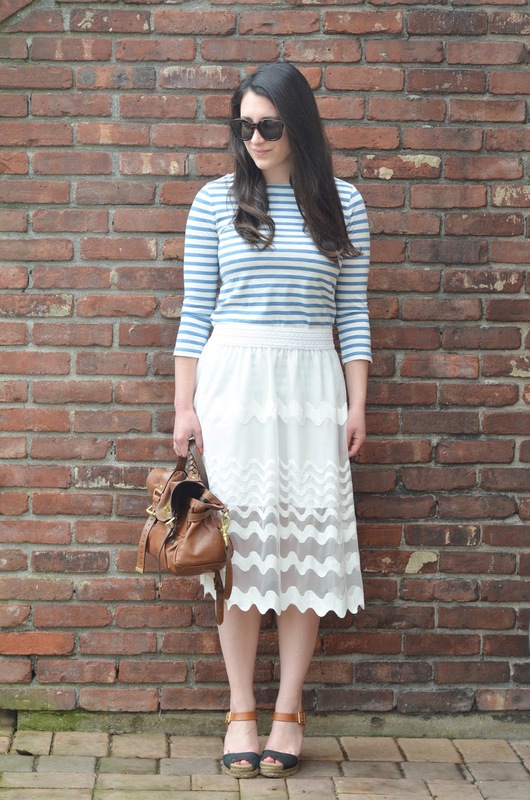 This outfit is SO cute and perfectly nautical! Oh my gosh, that skirt is amazing! And I love it with the striped shirt! That skirt is sooo pretty! And I'm loving those Tory wedges! Just found your blog - so cute! :) Following!